Overlooking vista of Nha Trang. 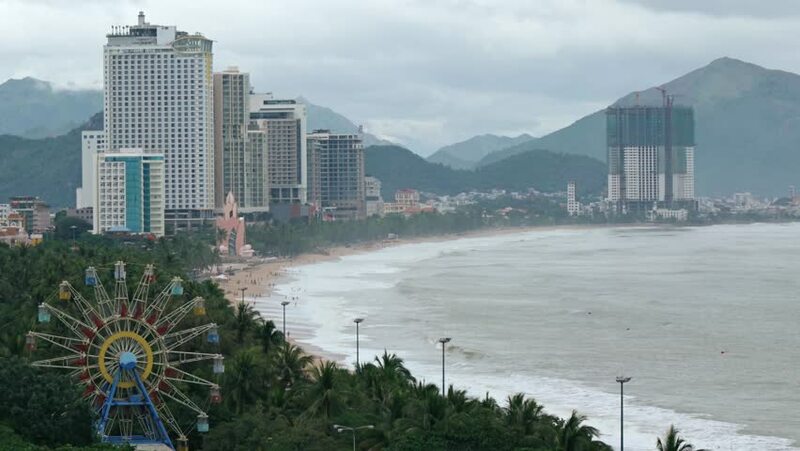 Vietnam's coastline and cityscape. with highrise residential buildings. tropical palm trees and a Ferris wheel. hd00:08VANCOUVER, CANADA - AUGUST 24, 2016: A young woman speed walks along a seaside path with English Bay and downtown in back. Speed or power walking is gaining popularity as an alternative to jogging. 4k00:25Honolulu, Oahu, Hawaii circa-2018. Aerial view of Waikiki Beach. Shot with Cineflex and RED Epic-W Helium. hd00:15Woman tourist taking pictures at Repulse Bay beach, Hong Kong. Beautiful Asian woman in summer dress enjoying view. Hong Kong travel and tourism concept. hd00:10SINGAPORE - April 19, 2017: Merlion Park and the Central Business District in Singapore at early morning. Left to right pan.